Review: "Metal Church: Weight Of The World" - Sea of Tranquility - The Web Destination for Progressive Music! 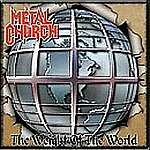 The power/thrash metal legends Metal Church return to their congregation 2004 with Weight Of The World. This album contains 10 brand new hymns, which are indeed in the classic Metal Church style of the 1980's. Despite having a new voice behind the pulpit, new Reverend Runny Munroe adapts well. After all many churches change reverends throughout the years don't they? He doesn't quite have the Dirkschnieder/Gillan type of attack that original reverend David Wayne had or the soaring delivery of Mike Howe. To me he sounds like he is somewhere between current Helloween vocalist Andi Deris, and former Black Sabbath vocalist Tony Martin in terms of style. The production on this album is very good, with nice punch and a nice meaty guitar sound. The guitars themselves still have the galloping riffs, Maidenish harmonies, and crunchy power. The only original members remaining are lead guitarist (and Head Deacon) Kurdt Vanderhoof and drummer Kirk Arrington. New members Jay Reynolds (formerly of Malice) on guitar and bassist Steve Unger do a nice job in keeping the feel of Metal Church in their playing. Reynolds' guitar meshes very well with Vanderhoof's guitar. To ask the band to achieve the heights of albums like their astonishing debut Metal Church, The Dark, or Blessing In Disguise might be asking too much this many years later. However the album does capture the spirit of what Metal Church was all about in those days. The thrashing power in the title track and "Leave Them Behind". There is also the epic grandness in "Madman's Soul". One thing that impressed me about the Metal Church of yesteryear was their ability to write dark moody songs that blended mellow sections with heavy ones in a dramatic atmosphere in songs. They do just this in tracks such as "Wings Of Tomorrow" and the ominous "Time Will Tell". This album sits very nicely along side Iced Earth, Nevermore, and current Iron Maiden. I have to admit to being very pleased to hearing such a solid outing from one from thrash's old school. After being disappointed with current efforts by Megadeth, Slayer, and Anthrax, and outright hating Metallica's work for the last decade. Weight Of The World is indeed a very refreshing listen! So metal fans, I encourage all of you to pay a visit to the new Metal Church and drop an offering in the plate. You will indeed be blessed!